These Signature Series Ball Holders are great way to present treasured sport ball. You have three choices, softball holder, baseball holder, or a flexible choice that will accommodate a football, basketball, soccer ball, or volleyball. The softball and baseball awards have detailed gloves for the specific sport that will hold their respective ball. The other ball holder has a large cradle area that securely holds the ball of your choice. All of the holders have a gold finished star at the center along with other gold accents. A large plate provides enough room for whatever your personalization needs might be to complete the overall award. Style and elegance cannot even begin to describe these Signature Series Bronze Soccer Ball Awards. The bronze metallic finish of this award is present in the highly detailed soccer ball that is shown elevated in the air by a highly stylized "V" all flowing into an elegant base. Plenty of room is provided for whatever your personalization needs might be. These awards are available in three sizes, 7 1/2", 12", and 15" giving you the ultimate in flexibility for your awards presentation. These are the ideal awards for your soccer needs that anyone would be excited to receive and proudly show. Style and elegance cannot even begin to describe this Signature Series Bronze Soccer Jersey Award. This award highlights the icons of the sport that include a soccer ball, a cleat, all set in front of a soccer jersey while the bronze metallic finish completes the look. Plenty of room on the base is provided for whatever your personalization needs might be. 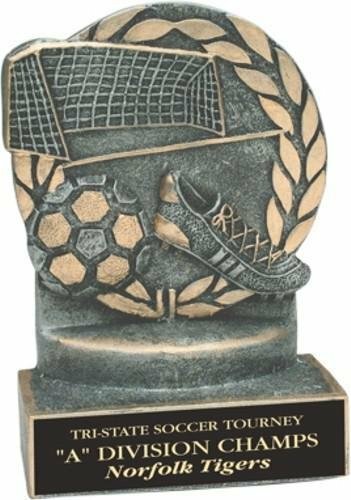 This award stand 4" tall and is the ideal award for any soccer recipient. Stylish design along with lots of detail makes these Signature Series Soccer Awards a great choice. The soccer players are shown with the soccer ball at their feet getting ready to kick that winning goal. Great flexibility is provided with these awards as they are available in both male and female versions, they stand 8" tall and come in a gold tone finish. The base on these awards provide plenty of room for whatever your personalization needs may be. These awards will be perfect for your next soccer event. Lots of action is packed into these Signature Series Soccer Shield Awards. The players in the award are raised providing a 3-dimensional look. A soccer player leg back and in full motion of getting ready to kick the ball into the goal is at the center of the award while two other players are shown in various actions. These shield awards are available in male or female versions and measure 8" X 8 1/2". A large area at the bottom of the award can accommodate your personalization needs while the gold and pewter finish complement the look of the award. This item can either be hung on a wall or placed on a desk using the included stand.